To make engineering cool, accessible and relevant to girls will literally change the world. Engineers are responsible for building the products and spaces that we use every day; yet, only 13% of engineers are women. We live in a world designed and built by men. Discouraged by this low rate of engagement, Stanford educated engineer Debbie Sterling decided to encourage girls to use construction toys. Typically this type of toy is made for and favoured by boys. The toys end up in the blue (read “boy”) area of the toy department and provide only male role models as engineers. 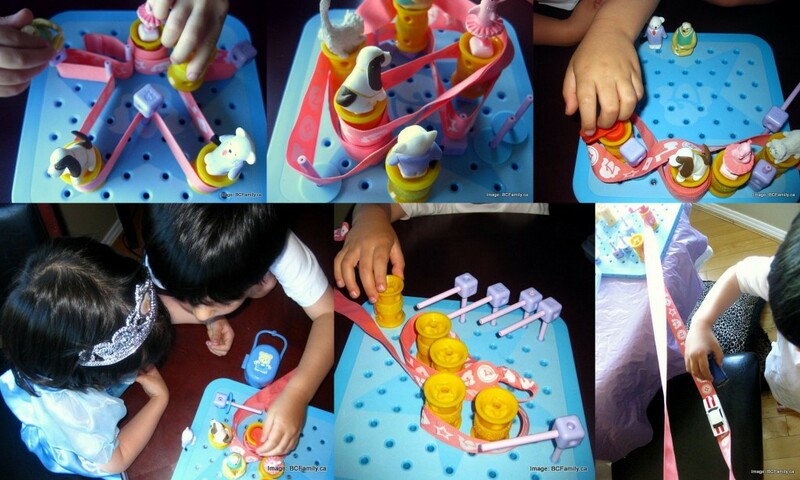 The Goldie Blox and the Spinning Machine toy is designed to to encourage girls to try skills that might one day lead to an interest in a career in engineering or technology. 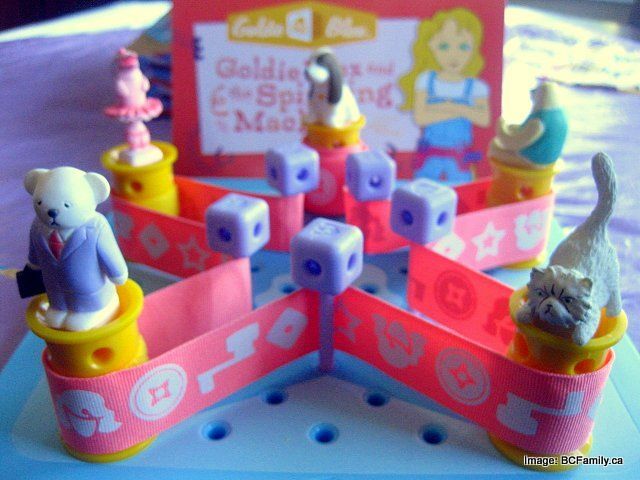 Goldie Blox is an engineer who is a non-nerdy, non-Princess role model for girls. After spending a year doing background research, Debbie Sterling focussed on the idea that girls enjoy reading. She developed a story about girl inventor Goldie Blox as an invitation to draw girls into the story and the concept of the toy. The game is designed to help develop spatial relationship skills, understand basic engineering and building principles, and strengthen confidence in problem solving. The user learns about belt drives and friction while trying out new designs. The structure seen on the right is located in my son’s room. My daughter is gradually extending the buildings across his floor. At our house we have plenty of gender neutral construction toys. Our four year old twins (boy and girl) started out with larger Duplo and moved on to wooden blocks (coloured and uncoloured); medium sized Lego with themes that were soon forgotten; and, similar construction toys. Our girl loves to build and create structures with these toys. Recently she had a chance to try Lego designed for girls. As it turns out, two sets that we had purchased for a birthday gift turned out to be duplicates. We decided to make the sets available to both twins and noticed that after the excitement of building the themed pieces had ended, the children don’t reach for this less open ended type of Lego. The day arrived for us to try the spinning machine, to use the children’s name for it. They also call it the boy and girl toy. Since the toy is a hot, new and innovative toy on the toy market, I was keen. To help celebrate the launch, my daughter went off to find her Cinderella dress and tiara. She isn’t an avid 24/7 princess fan but – oh sweet irony of ironies – on this day she HAD to dress up as a princess. She rocked the look while she worked that toy! As we read the story, my children responded enthusiastically to the projects that Goldie was undertaking in the book. “Could we build a machine like that?”, my son asked. After reading the book, we built the first pattern – the Gingerbread Man – which is found at the beginning of the pattern section. Since our children are two years below the recommended age of 6+, it seemed to be more appropriate to take an open ended approach to using the game. The children had to be free to experiment with the toy pieces and try out patterns, even if they didn’t conform closely to the types of plans seen in the book. Son: What are you making? Son: How will it work? Daughter: You will see tonight. We built the first design together and the children saw how the lever, wheels, axles and other parts worked. Then I asked the children to try and build their own patterns. They’ve been playing independently with the set ever since. They take out the book to analyze the patterns but seem to have forgotten about the story. A second reading would help now to refresh their memory. Now that they are comfortable using the pieces, I have pointed out that there are other patterns that they can follow. They try to follow them but haven’t mastered the understanding that the holes on the pattern correspond directly to the holes on the pegboard. It would be helpful if the star pattern on the pegboard was replicated in the paper version of the toy shown in the book. Even though you can copy patterns shown in the book, the second stage is the creation of your own patterns. My children quickly discovered that they could make all kinds of elaborate designs. Their favourite design is an elevator for cars – an extension beyond the perimeter of the pegboard. Goldie Blox will get you thinking – if you’re not already – about the colour and gender divide in large, big box toy stores. If you are looking to find toys that circumvent the stereotypes that many toys promote, check out your local, privately owned toy store and join their Facebook and Twitter pages so that you can hear about special events and sales. My son (left) and daughter using the car wash that my daughter designed. The fire truck is being put through the steps of being sprayed, running through rollers etc. Cost: $29.99 (US) online on Amazon.com. Store location: Available at Toy Jungle stores and the Village Toy Shop in Port Moody. Other locations in BC and Canada can be found on the GoldieBlox.com website. Village toy Shop will run a 25% off programme for VIP club members on Sept. 28th – 30th, 2013, 10 AM – 6 PM. *** Thumbs up but have a few reservations. Note: Goldie Blox is designed for children six and up. If your child is precocious or very curious, why not provide the opportunity to try the set a few years earlier? (There are choking hazards for children 3 and under. Keep this in mind if you have smaller children around the house.) To encourage your child to not lose any of the pieces, place small Tupperware containers inside the box to hold the 33 pieces. Have you seen the Goldie Blox commercial that’s making its way through people’s homepages on Facebook? I think they might have lifted the idea from my children! 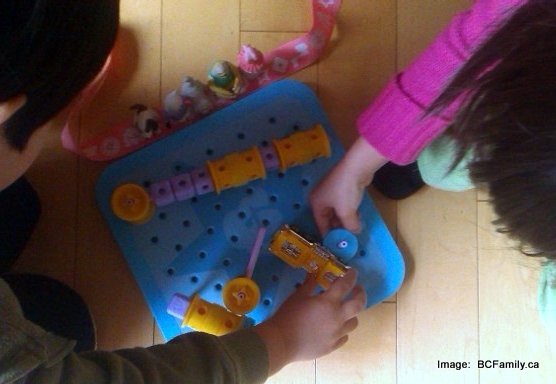 OK maybe not but my daughter and son both like to do things like create pulleys off the peg board that can be used like an elevator to move cars up and down off the table. …and they’re two years below the 6+ recommended age. I can believe older children could take the parts across the room and out the door. Can a kid’s toy bring more women into engineering? Disclosure: I have no material connection to any person, company, product, or service mentioned on this page. This is a fancy way of saying that I was not compensated for this review. Neither did I receive free products. The opinions expressed on this page are my own. Please also refer to the privacy statement regarding information about third party sites and their products.